The Golden Gate Regional Center (GGRC) is reporting a dramatic 719% increase in autism cases from 71 in 1990 to 707 in 2014. The adult autism population is projected to double from 508 in 2015 to 1,033 in 2025. We are in desperate need to increase and improve housing opportunities for this population. Thank you to the Autism Society of the San Francisco Bay Area for providing this information! The number of SF autism cases served by the Department of Developmental Services and Golden Gate Regional Center has grown sharply over the past three decades. To qualify as DDS autism, the the individual must be substantially developmentally disabled, this is not the broader definition sometimes used in medical ﻿﻿practice or in specia﻿﻿l education. 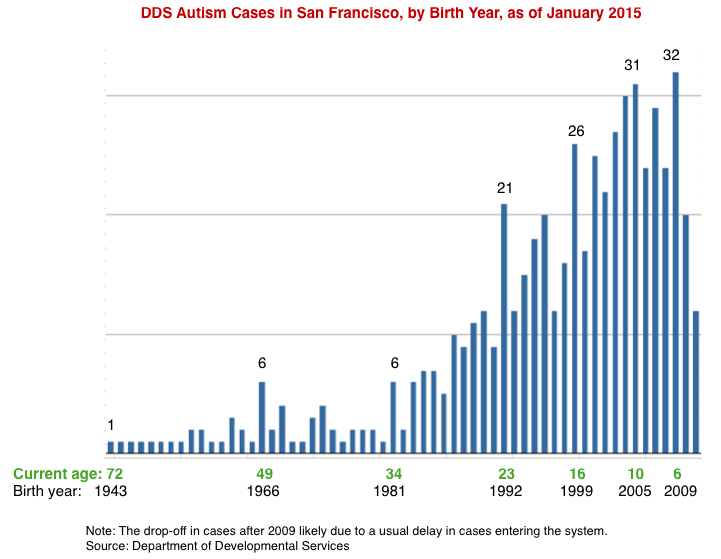 The true "autism" population in San Francisco is likely considerably higher than the numbers in the DDS system (see "San Francisco Students with Autism" column at right for an illustration of that in ages 3-21). Data as of January 2015. In San Francisco, as of 2013, there were 747 students, aged 3-21, identified as eligible for special education services under the category of autism, up from about 150 in school year 2000-01. The same age cohort in the DDS system counts about 400 autism cases, meaning the school system serves 347 additional young people with autism than in the DDS system. In other words, in San Francisco at this time, only about half (46%) of the publicly identified young autism population, ages 3-21, is served by DDS. This could be an indication that the 347 additional school district cases are considered too mild for DDS eligibility, there is a delay or lack of interest in attaining DDS eligibility, or a combination of those factors.